Seventy-four year old Sandy Sargent was an avid hiker who had always found it hard to sit still, so she never expected her nagging cough would turn out to be anything beyond a seasonal cold. When an X-ray confirmed a stage 4 lung cancer diagnosis and her doctor estimated she had six to nine months to live, it took her breath away. "I'm not the type of person to cry or feel defeated. I had so many reasons to keep breathing, like a great-grandson on the way and a husband who relies on me. So, I worked with my healthcare team to make a plan." 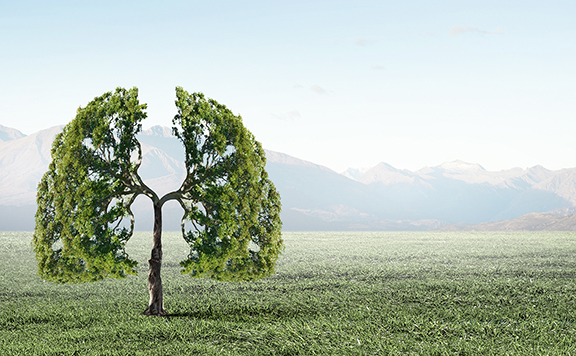 To determine the best treatment approach for stage 4 lung cancer, tests are ordered that look for certain "biomarkers," or characteristics that can be used to help create a personalized care plan. Treatment is then based on those results. November is Lung Cancer Awareness Month, and Sandy is using her breath in a new way: to spread the word that people with lung cancer need to understand their disease better so they know how to talk to their doctor and to find ways to stay positive. "I hadn't even heard of a 'biomarker' before I was diagnosed. People need to learn as much as they can about their cancer so they can be their own advocates." There are several different types of lung cancer, and how the disease looks and progresses can vary significantly among different people. As scientists have learned more about the disease's complexities and the human body, they have been better able to tailor treatment approaches to individual needs. Biomarker testing and today's lung cancer therapies have helped improve patient care, as a personalized medical approach helps doctors better devise effective treatment plans. Doctors also need to encourage patients to work with their doctor on lifestyle changes they can stick with and to find support from loved ones or in their communities. As for Sandy, she is not taking any breath for granted. "Cancer doesn't define me. I continue breathing for all the new adventures I want to have with family and friends. That's my wish for others going through this — to find something that motivates you and hang onto that, to have hope."